WASHINGTON — The United States has determined that North Korea used chemical weapons, an apparent reference to the killing of leader Kim Jong Un’s half-brother last year. The State Department did not provide justification for the finding publicized Friday. But it comes nearly one year after Kim Jong Nam died at an international airport in Malaysia in an attack authorities said used VX nerve agent. The determination, made by the department’s international security and nonproliferation bureau, carries restrictions on U.S. foreign aid and financial and military assistance that North Korea’s heavily sanctioned government is already subject to. It was posted on the website of the Federal Register and takes effect Monday. According to the Pentagon, North Korea probably has a long-standing chemical weapons program with the capability to produce nerve, blister, blood, and choking agents and likely possesses a chemical weapons stockpile that could be used with artillery and ballistic missiles. Experts say the Feb. 13, 2017, death of Kim Jong Nam at Kuala Lumpur airport is the only confirmed North Korean use of chemical weapon agents. North Korean defectors have charged that such chemicals have been used against prisoners and disabled people inside the authoritarian nation. Last year, Malaysian toxicologists have determined that a chemical weapon was used to assassinate the half-brother of North Korean leader Kim Jong Un. North Korea is believed to have provided chemical defensive equipment and technology to Syria and Libya in the past, and an upcoming report by a United Nations panel that monitors sanctions against the North says that in August 2016 the North transferred special resistance valves and thermometers known for use in chemical weapons programs in Syria. 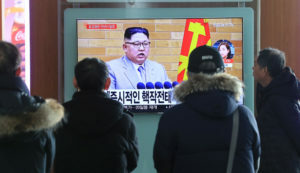 North Korean technicians continue to operate at chemical weapons and missile facilities in the war-ravaged Mid-east nation, according to details of the report obtained by The Associated Press. The U.S. and other Western nations have accused Syria of using chemical weapons against rebel-controlled areas of the country, which the government denies. Associated Press writer Matthew Lee in Washington and Edith W. Lederer at the United Nations contributed to this report.